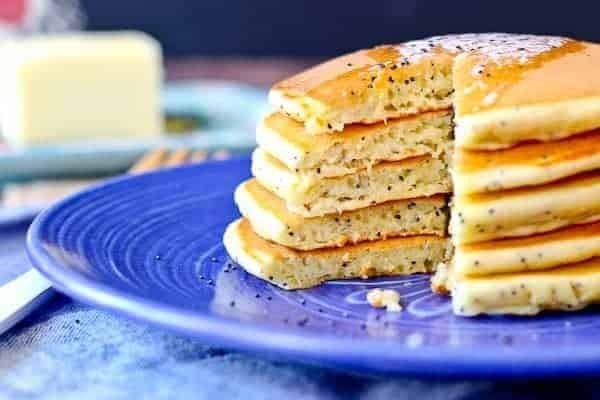 These Lemon Poppy Seed Cottage Cheese Pancakes start your day with protein and flavor! They’ll quickly become a new breakfast favorite. 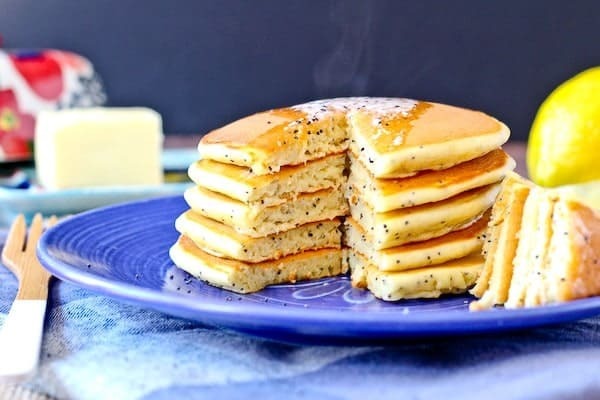 I was going to call these “lemon poppy seed pancakes with a secret ingredient,” but I’ve never been good at keeping secrets. The secret ingredient is cottage cheese. I pureed cottage cheese and added it to the pancake batter to create protein-packed, perfectly moist pancakes. I’m not sure I’ll ever make pancakes without cottage cheese ever again! And let me tell you this – my kids LOVED these cottage cheese pancakes. My protein-hating, picky son who only gets protein from milk and eggs loved these pancakes. Sneaky mommy, happy kid. Everyone wins. 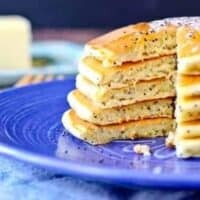 And can we talk about lemon poppy seed for a second? The classic combination is perfect for breakfast and just what we need as the winter months drag on…and on…and on…. We had 2 days of warm weather. One of those days was filled with gusty winds that would definitely blow my 3-year-old away. So, one day. One day of warm weather. And then back to cold. Michigan is such a tease. But it was nice to have a reminder of what is to come. Walks outside, sunshine and being able to leave the house without having to put 12 layers on each of the kids before stuffing them into their carseats. Lemons give me the same gentle reminder of warmer days and refreshing flavors. I can’t wait to squeeze a lemon over some chicken breasts and grill up some chicken tawook. Or squeeze some lemons into a pitcher of refreshing lemonade. 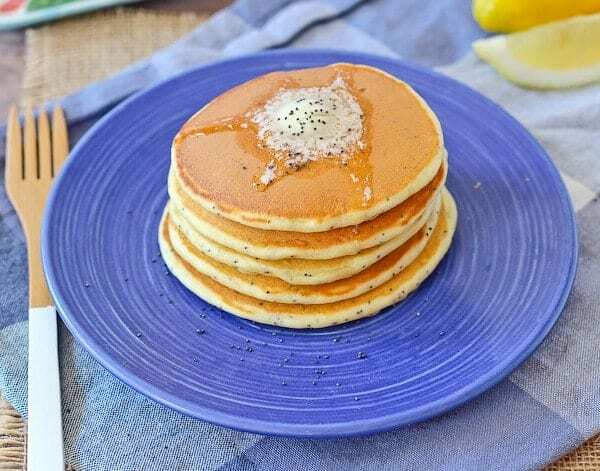 In the meantime, lemon poppy seed cottage cheese pancakes. 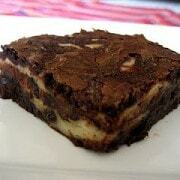 In a blender, combine eggs, cottage cheese, vanilla, canola oil, lemon zest, lemon juice, and milk. Blend until smooth. 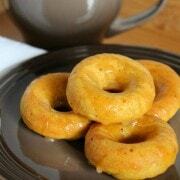 In a medium bowl, mix together dry ingredients (flour, baking powder, salt, sugar, and poppy seeds). To the dry ingredients, add the blended wet ingredients. Stir until just combined. Meanwhile, heat a large skillet over medium heat – grease or spray if needed. Drop batter by about 1/4 cup amounts onto the preheated skillet. Cook for about 1-2 minutes on each side (will depend on the heat of your skillet) or until golden brown and cooked through. Serve immediately. Verdict: Obsessed. I may never make pancakes without cottage cheese. Except that I already have. I’m an equal opportunity pancake eater. Husband’s take: Ben and the kids loved these cottage cheese pancakes. I love the idea of different flavored pancakes! 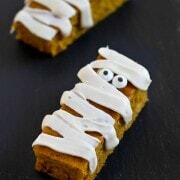 I can’t wait to try making these! I’ve been dreaming of spring and warmer temps to stick too and these lemon pancakes are perfect for bringing in some indoor sunshine :) Love the cottage cheese! We are in northern Indiana and our weather was the same! It was nice while it lasted but the cold is back for sure! These pancakes would be a hit in my house! :) it totally works, though! ooooh, sounds so delicious! i love pancakes, but hate the sugar crash that follows since most recipes don’t have enough protein. love this addition! Yes! Exactly. I need protein at breakfast.